Founded in Detroit, Michigan in 1885, Phoenix Wire has been owned and operated by the same family since it's start. It is a manufacturer of Wire cloth, Saftey systems, Wire Mesh Partitions and Bathroom Partitions. They pride themselves on quality and customer satisfaction, and have continued to grow and manufacture the finest material in the world. They promise quality from engineering to packaging, and claim to maintain design standards efficiently. 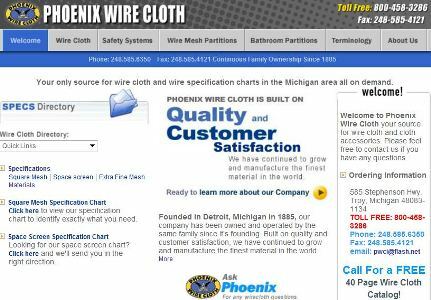 Phoenix Wire Cloth, Inc. employs approximately 60 employees in our 60,000 square foot facility in Troy, Ml and ships product around the world.